"When Captain America throws his mighty shield..." You know the rest. One of Marvel's oldest and most beloved characters, Steve Rogers, also known as Captain America, was first introduced in 1941. Over the past 75 years, the character has starred in thousands of comic books, cartoons, motion picture serials, and, most recently, 2016's premiere blockbuster event, Captain America: Civil War. Cap has also starred in several video games, and while he's occasionally been the lead character, he's more often featured as part of a larger ensemble. Let's take a look back at some of Captain America's most memorable pixelated adaptations. 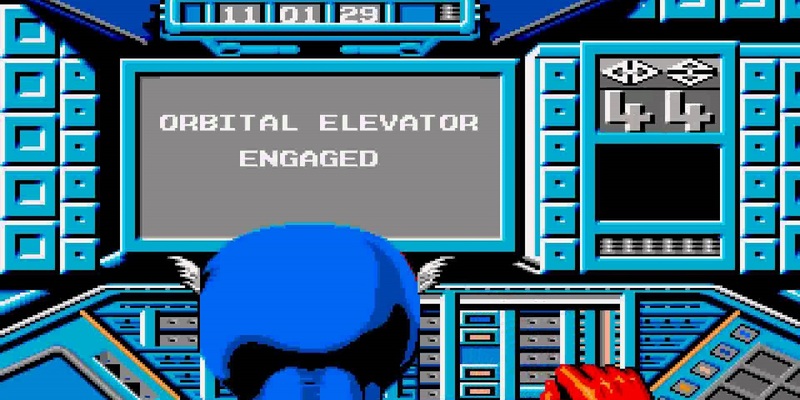 Captain America's first-ever videogame role was in the amusingly-titled Captain America Defies the Doom Tube. Versions of the game were published on Commodore 64, ZX Spectrum, and Amstrad CPC, some of the leading home computers of their time. The action/adventure title received mixed reviews for its poor graphics and hyper-basic gameplay, even for 1987 standards. One novel feature of Doom Tube was that it played out in real time — players had only one hour to navigate the labyrinthine maze and defeat Dr. Megalomann. The game is hilariously dated by today's standards, and wasn't particularly cutting edge for its time; by 1987, the C64 and its ilk were quickly losing ground in gaming circles to the Nintendo Entertainment System. In 1989, home computers saw another title, Spider-Man and Captain America in Doctor Doom's Revenge, which was completely unrelated to Doom Tube. Doom's Revenge had players switching back and forth between Captain America and Spider-Man while fighting through a roster of classic comic book villains, including Rhino, Electro, and, of course, Doctor Doom. This title was notable for including a printed prequel comic which is surely a precious collector's item these days. 1991 saw the release of Captain America and The Avengers, a side-scrolling beat-em-up in the style of Double Dragon and Final Fight. While it was ported to Super Nintendo and Sega Genesis, the best version of the game, as was usually the case back then, was the arcade original. While some arcade cabinets featured a two-player mode, others allowed for simultaneous four-player action. Aside from Captain America, the other playable Avengers were Hawkeye, Vision, and Iron Man, all on a quest to beat the tar out of the evil Red Skull and his minions. Special power-ups summoned other Marvel Comics heroes who would offer assistance to players, including Namor the Submariner and The Wasp. 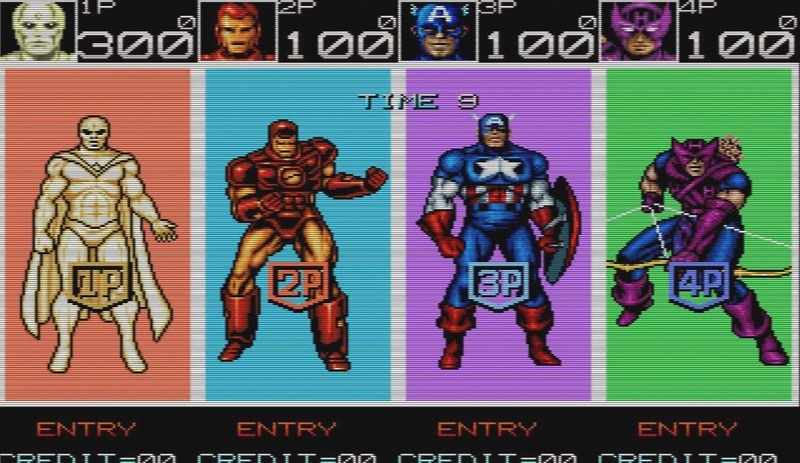 Captain America and The Avengers is one of the more enduring old-school brawlers, often held in the same esteem as Konami's legendary X-Men and The Simpsons titles, and it can still be easily found at most of the remaining videogame arcades. Capcom released two games with the name Marvel Super Heroes: the first is the one-on-one arcade fighter which served as the precursor to the legendary Marvel vs Capcom series, and the second is a side-scrolling action/adventure title for the Super Nintendo. Both games were based on the Infinity Gauntlet storyline, a plot which will be retold in grand fashion in The Avengers: Infinity War films. The 1995 arcade fighter would eventually be ported to Sega Saturn and Sony Playstation in 1997; the game also made its way to HD consoles as part of Marvel vs Capcom Origins, which saw release on PS3 and Xbox 360 in 2012. However, after Capcom's license with Marvel expired, the game was unceremoniously discontinued, much to the chagrin of fans. The Super Nintendo version, Marvel Super Heroes: War of the Gems, featured five playable characters; in addition to Captain America, players could take control of Iron Man, Spider-Man, Wolverine, and The Hulk in their quest to collect the Infinity Gems and stop the Mad Titan Thanos. War of the Gems is regarded as a classic action title, but unfortunately never saw an official re-release in the decades following its 1996 release. 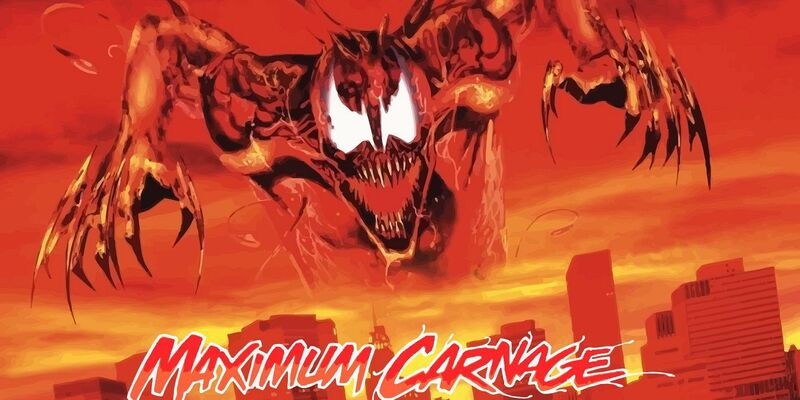 Maximum Carnage is an awesome title, and it's also a pretty cool game; it was probably the first time gamers truly felt like they were fighting their way through the pages of a comic book, predating Comix Zone by nearly a full year. Maximum Carnage was adapted from the '90s Spider-Man storyline, which saw Spidey and Venom teaming up to take down Carnage, a being of pure evil. 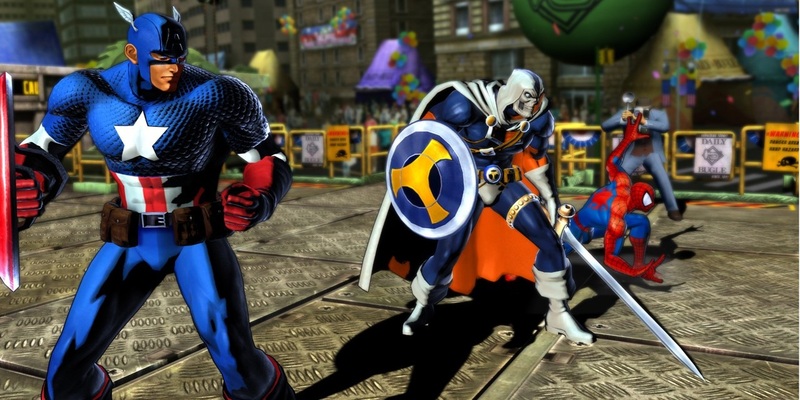 While Captain America didn't have a leading role in the game, he did make a couple of noteworthy appearances; he showed up in the story, offering assistance to a defeated Spider-Man, and he also shows up as an assist character. Upon being summoned, Cap jumps onto the screen and flings his mighty shield, causing massive damage to enemies. The actual strength of the Maximum Carnage comic series is a hotly debated subject amongst Spidey fans, but Maximum Carnage, the videogame, is a solid and righteous example of the 1990s beat-em-up genre. First, Capcom made Street Fighter II, the 2D fighting game by which all others continue to be judged to this day. After getting their hands on the Marvel license, Capcom developed titles like X-Men: Children of the Atom and the previously mentioned Marvel Super Heroes. Eventually, someone got the genius idea that Marvel characters should fight against Street Fighter characters. After dabbling in the crossover realm with titles like X-Men vs Street Fighter and Marvel Super Heroes vs Street Fighter, they finally came up with Marvel vs Capcom, in which a legion of Marvel characters went up against characters from all of Capcom's famous properties. 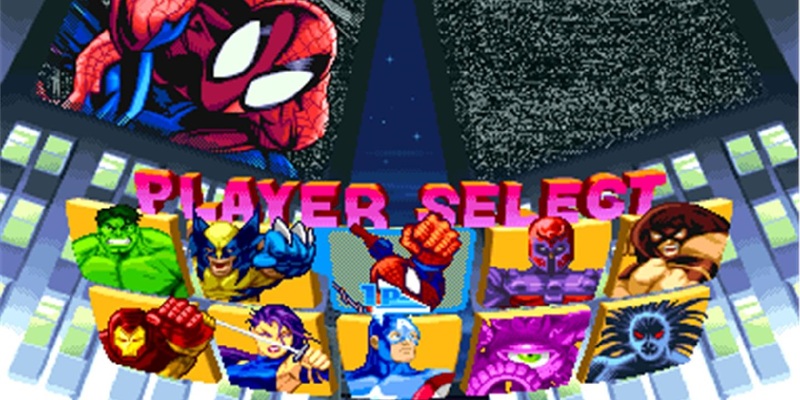 Marvel vs Capcom 2 (often cited as one of the greatest, if most hilariously unbalanced, fighters of all time) featured a mammoth roster of 56 characters, encompassing Capcom franchises like Mega Man, Resident Evil, and Darkstalkers, alongside Marvel favorites like Captain America, Juggernaut, and Doctor Doom, among many others. The most recent entry in the series (and possibly last, since Capcom lost the Marvel license in 2014), Marvel vs Capcom 3, ran on the Street Fighter IV engine and introduced characters like Devil May Cry's Dante, Dead Rising's Frank West, and everyone's favorite Merc With a Mouth, Deadpool. Maybe one day, Marvel vs Capcom will return, and we can once again return to the age-old question — who would win in a fight: Captain America or Albert Wesker? 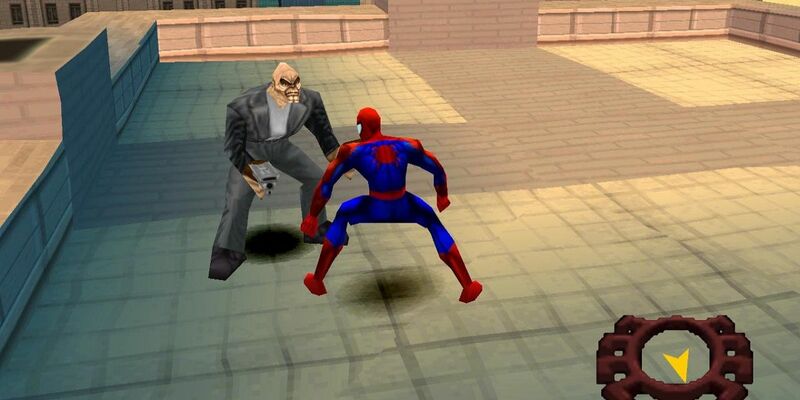 Neversoft's 2000 opus, Spider-Man, featured no playable characters aside from the titular web-head (unless one counts the alternate costume appearance of Ben Reilly, and we absolutely don't), but Captain America still managed to score a memorable appearance. This narrative-driven experience featured Spider-Man crossing paths with a number of famous Marvel faces, including The Punisher, Daredevil, The Human Torch, and the Star Spangled Man himself, Captain America. At the end of the game, while Doctor Octopus's aquatic base is exploding around him, Spider-Man is rescued by none other than Steve Rogers, who flies in to save our hero. During the game's ending, Spidey celebrates his victory by playing a friendly hand of Go-Fish with his friends, including Cap. It's a hilarious finale to a relaxed game about how awesome it is to be a super-hero and save the day for a living. Captain America: "Punisher... Do you have any threes?" Marvel Nemesis: Rise of the Imperfects is a mostly-forgotten one-on-one 3D fighter for the PS2, Gamecube, and Xbox. In it, Captain America is only mentioned in passing, as having been defeated by the titular Imperfects, a threat created specifically for the game. However, in the handheld PSP version, Captain America is a playable character, alongside Doctor Doom, who is also exclusive to that version. On the other hand, Daredevil and Human Torch were cut to make room for Doom and Cap, so it's a trade-off either way. Marvel Nemesis was also the title of a six-issue tie-in comic book series, which explained the backstory to the game and filled out the new characters. Though the game and the comic contradict each other multiple times, the idea of sharing a universe across a fighting game and a comic book series is an endearing one which saw greater success in the excellent Injustice: Gods Among Us and Mortal Kombat X titles. Warner Bros. is killing it when it comes to comic book fighting games, but we're hoping Marvel may one day step back into the ring with a new multimedia project...Perhaps an MCU tie-in game? After developing two X-Men action-RPGs for PS2, Raven Software took on the entire Marvel roster with Marvel Ultimate Alliance, an all-star team-up of Marvel's greatest heroes. The game featured an original story which featured Earth's Mightiest Heroes (and Deadpool) taking on Doctor Doom and a veritable legion of other super villains. 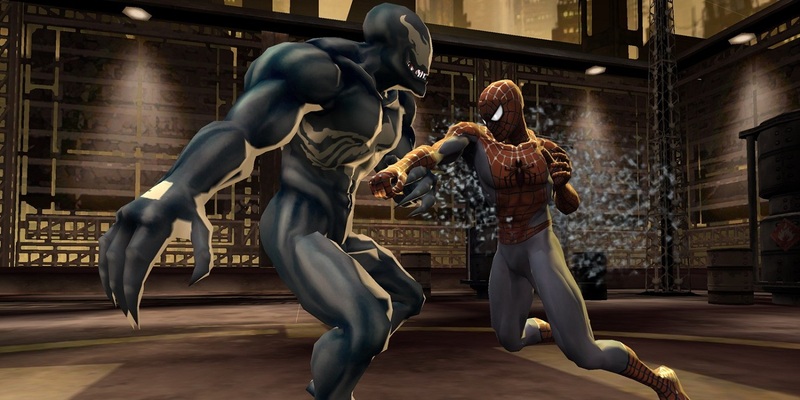 Ultimate Alliance was praised for its pulpy story, button-mashing action, and deep RPG elements. Development on the sequel was outsourced to Vicarious Visions, who streamlined the role-playing elements. On the other hand, the graphics and storytelling of Marvel Ultimate Alliance 2 were a huge improvement over its predecessor, and the addition of ragdoll physics into the already pulse-pounding combat more than made up the difference over the less fan-friendly changes. Interestingly enough, Ultimate Alliance 2 adapted the comic book storylines Secret War and Civil War, the latter of which is also the basis of the latest Captain America film. The player is forced to choose between being pro-registration or anti-registration, and certain characters are locked to one side or the other for much of the game, until a greater threat causes both sides to put their differences aside and fight together to save the world. That last bit seems to be a common occurrence in the world of cinema nowadays. Many fans were disappointed that Marvel's Phase Two didn't receive any tie-in games to capitalize on the monstrous success of the films. There was, of course, Lego Marvel Avengers (more on that in a bit), but there was nothing on the same level as the suite of games which accompanied Phase One... The only problem with those Phase One titles, however, was that they sucked. Iron Man sucked, The Incredible Hulk sucked, Iron Man 2 sucked, and Thor: God of Thunder sucked. 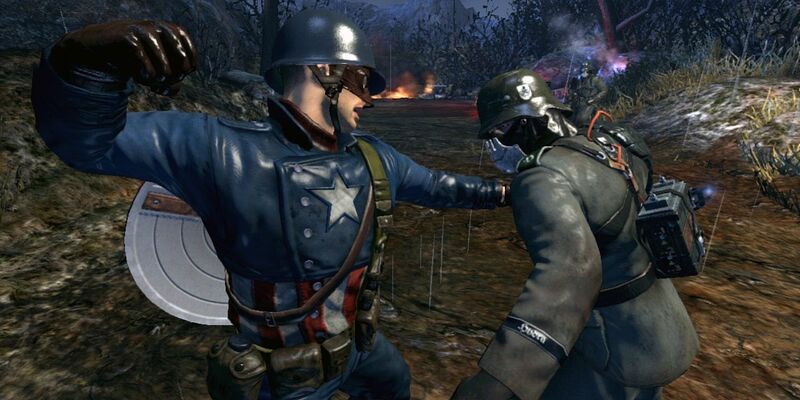 Captain America: Super Soldier, the tie-in game to The First Avenger...was actually quite good! It wasn't phenomenal, but it was a pretty competent second-rate clone of Batman: Arkham Asylum. The game benefited from a longer development cycle than the rest of the Phase One games, the voice performances were provided by (most of) the cast from the film, and the combat was decent and visually engaging. Cap's shield, in particular, steals the show as a supremely badass piece of equipment. If you're gonna play one MCU tie-in game that doesn't involve LEGO bricks, make it Captain America: Super Soldier. Fun Fact: Chris Evans has gone on record saying that Cap's more visceral and hard-hitting combat style, as first seen in The Winter Soldier, was partly inspired by the sleek fighting moves of this game. Developer Traveler's Tales has been making LEGO games since LEGO Star Wars way back in 2005. Their charming blend of platforming, combat, and light puzzle solving has managed to stay fresh for all these years, thanks in part to the numerous licenses the games joyfully adapt/poke fun at, including Star Wars, Pirates of the Caribbean, Lord of the Rings, DC's Batman, and Marvel's The Avengers, among others. 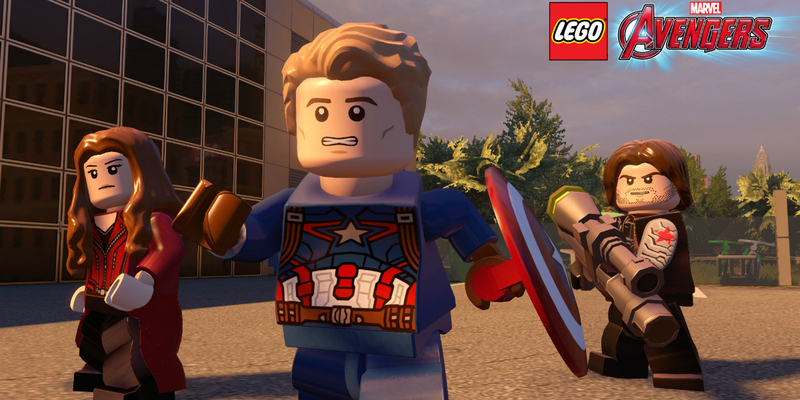 While TT's first LEGO Marvel game utilized the whole Marvel roster and told an original tale, the sequel focused mainly on adapting scenes from The Avengers and its sequel, Age of Ultron, as well as levels based on some of the other MCU films. LEGO Marvel's Avengers is somewhat limited by its adherence to the feature films, rather than the creative freedom of LEGO Marvel Superheroes. Still, it's great fun to reenact scenes from the movies, even in minifig form. The toys-to-life genre became a huge commodity in recent years, led by Activision's Skylanders series and Nintendo's line of collectible Amiibos. Disney's answer to the popularity of the genre came in the form of Disney Infinity. Taking the toy box creativity of the Toy Story 3 game and combining it with real toys and numerous Disney properties, Disney Infinity was a huge hit among kids and adults alike. 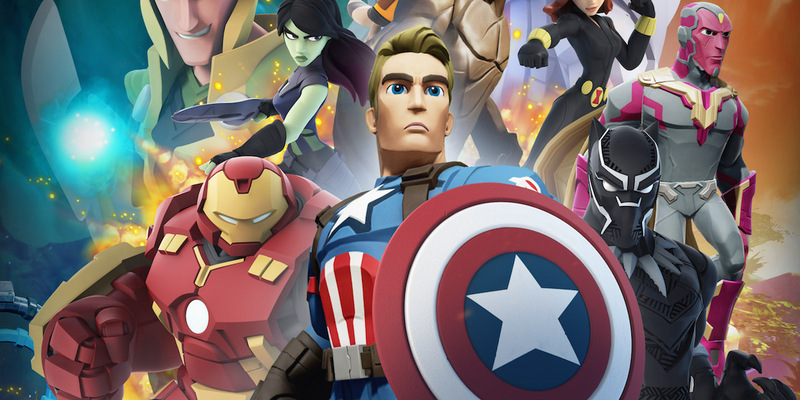 Disney Infinity's 2.0 edition was subtitled Marvel Super Heroes, and included a suite of Marvel's greatest heroes, including Captain, Spidey, Iron Man, and Black Widow. The true strength of the Disney Infinity brand lies in its Toy Box mode, in which the player can mix and match characters from any of the myriad Disney franchises included. If the player is so inclined, they can create adventures starring Captain America, The Lone Ranger, Aladdin, and Donald Duck, just to scratch the surface of the myriad possibilities. Disney Infinity 3.0 brought Star Wars characters into the mix as well, allowing Cap to fight side-by-side with Han Solo, Ahsoka Tano, and Boba Fett. And that's just awesome, plain and simple. 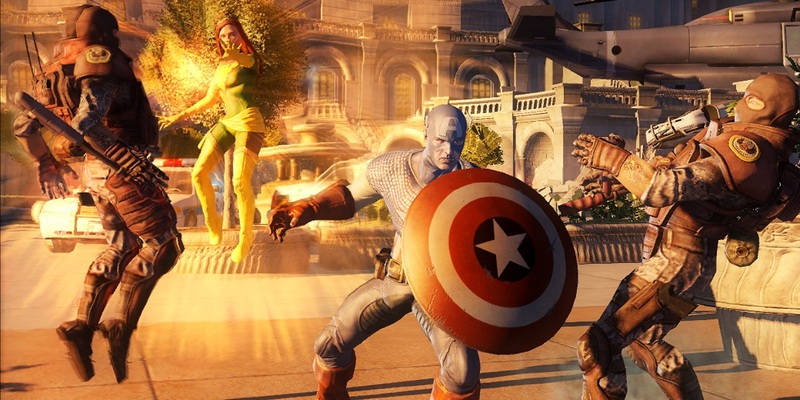 One of the most popular action-MMOs around today is Marvel Heroes, an online action RPG for Microsoft Windows which first launched in 2013, and has been building in strength and popularity since then. While the title received a mixed reception at first, it is also a shining example of the ever-evolving nature of the greatest Massively Multiplayer Online Games. The game launched with about 20 characters; today in 2016, that number is over 50... And, of course, the roster includes Captain America, as well as other heroes such as Winter Soldier, Captain Marvel, and The Punisher, just to name a few. 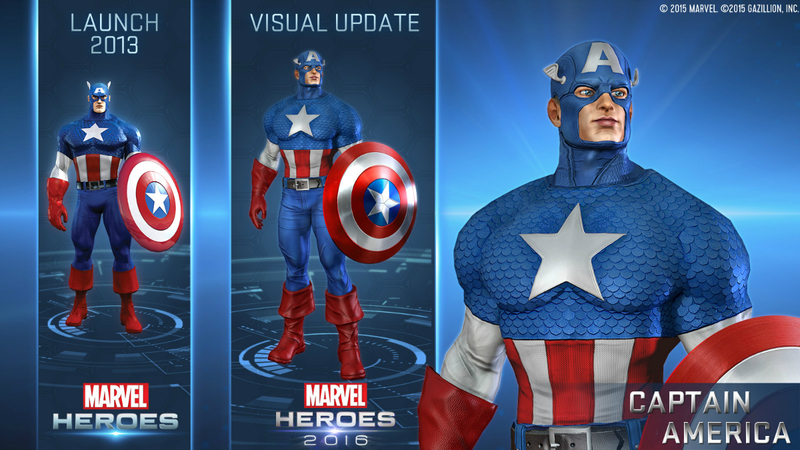 Marvel Heroes is free-to-play, and while monetization opportunities are in annoying abundance, it is relatively easy to enjoy the game without being forced to pay-to-win. We recommend giving it a shot; it's a fun action game with an engaging progression system and a metric ton of Marvel fan service. What's your favorite Captain America game? Would you like to have seen tie-in games based on The Winter Soldier and Civil War? Sound off in the comments below!